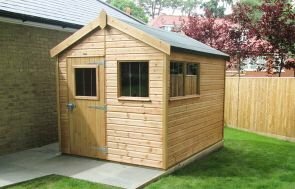 This Superior Shed is 2.4 x 3.0m, and it has been installed at the bottom of our customer’s large, country garden in Crowborough, East Sussex for use as an attractive, traditionally styled garden workshop. The colours the customer chose for their shed are all natural ones, to help it blend in nicely with the surroundings: there are natural cedar shingle tiles on the roof that will silver as they age, and two paint colours from our Valtti paint range: Lizard for the walls, and Ivory for the door and windows. The customer also chose to have white guttering along the front to protect the door and windows from water run-off from the roof. 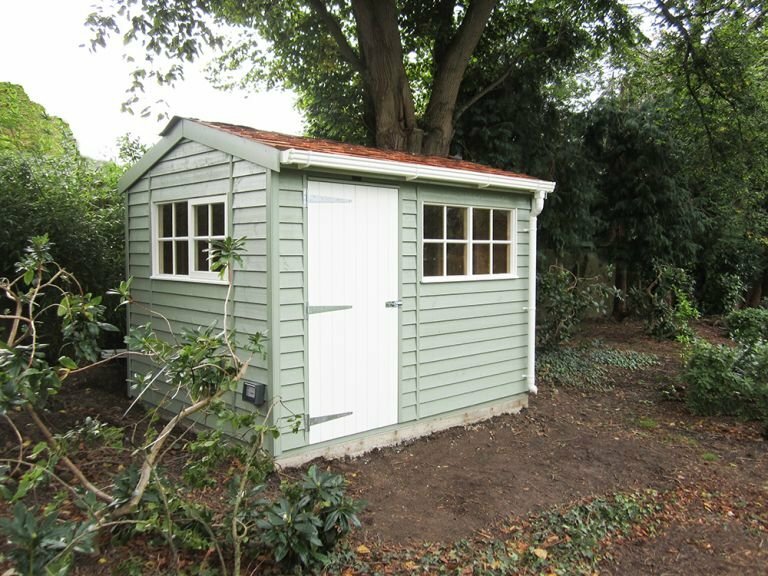 A few final touches give this shed a rustic, country style that really suit the customer’s garden: these features are Georgian windows, and weatherboard cladding. 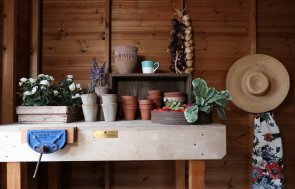 Internally, there is a workbench made from oak faced plywood to provide a sturdy work platform, and an electric pack to provide lighting, and power for their tools. 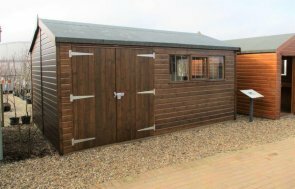 An attractive and highly practical shed, this building provides the best of both worlds to give the customer a place to work, as well as being pleasing on the eye. If you would like to know more about our Garden Sheds, please come and visit our Brighton Show Centre to view the buildings for yourself, or send us an online enquiry with any questions for us.